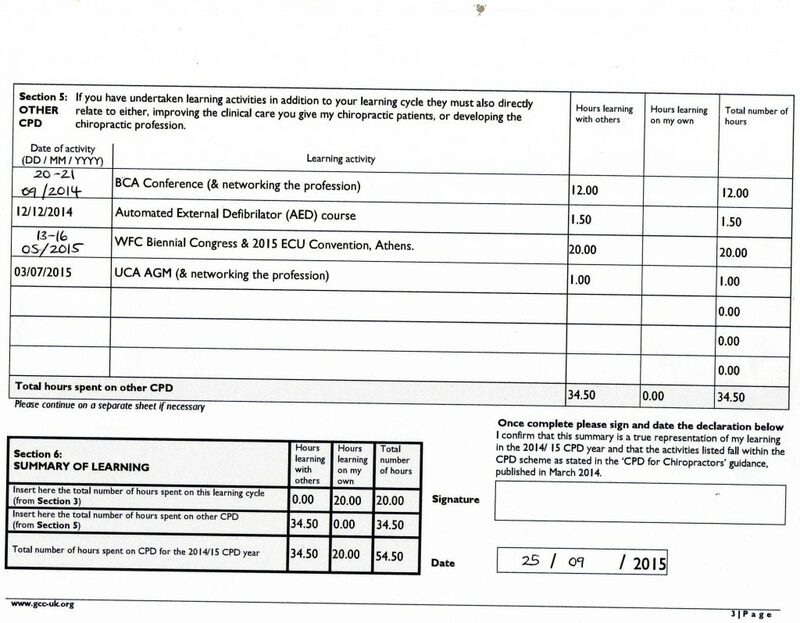 Thank you for your letter dated 2nd October regarding CPD points. 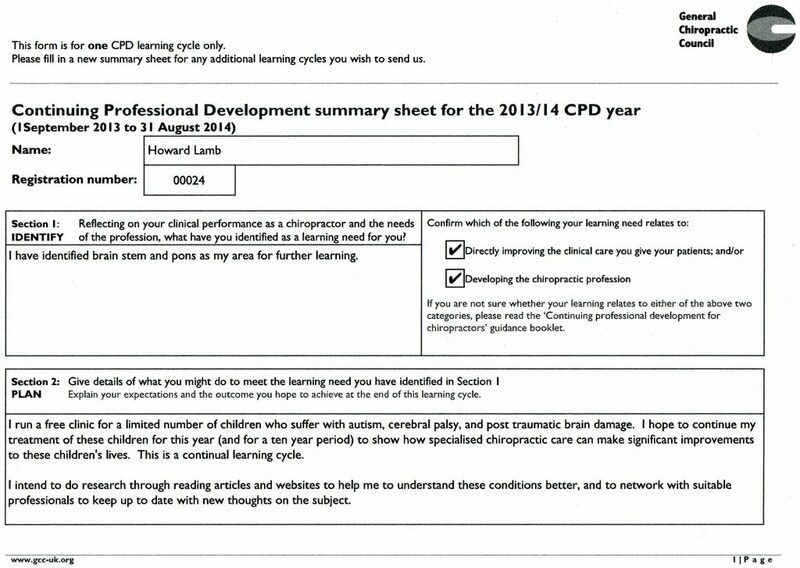 I believe that the consultations within the profession, regarding ‘the Chiropractic Act’ are valid for CPD points. How then is it possible that my research into the profession not developing properly since the original formation of the GCC and their protocols and procedures is not valid for the forum on ‘Said Act’. A test case in the courts regarding notes and note-taking came to the conclusion that they are the personal property of the practitioner, and as such cannot be the basis of prosecution. Yet the GCC are still prosecuting chiropractors and influencing subsequent legal proceedings, ie Mal-administration GCC – negligence in court. No proper right of appeal or suitable independent complaints procedure against the GCC. This would seem to be a possible breach of human rights. No interest in the disabilities legislation. This is probably also against the law and human rights, and is all covered in my research. e-mails etc that I have drawn back to find out if the GCC fulfilled their legal requirements, which are standard across the board, when informing a professional body of such acts, especially after ‘Baby P’ and a host of other cases which showed governing bodies and others tended to stick their heads in the sand. Not a great defensive position. As it would seem that I will not be able to call myself a chiropractor soon, it will be the end of an era, ie a family history since 1936 and an unblemished record of over one million patient treatments as a family practice. I will have to start to explain to my patients why I will not be insured, and why I can’t call myself what I am a world’s expert in. I have also found out in my learning cycle that if the GCC cannot stand up for a chiropractic patient or diagnosis, that you as a practitioner have no credibility with any other professional (including the GCC) as seen in the Child X and ambulance chasers cases. I believe that much of this is not covered by the new Chiropractic Act, so I have also leaned in my cycle that the GCC are wall-papering over cracks, and in time will harm the profession further by not correcting mistakes. Tick box, job done. I have handed this matter over to my association (BCA, MCA, UCA, and Royal College of Chiropractors) with this letter and will be sending authority for them to draw back all relevant documentation on both the child abuse and fraud cases. I will also ask them to find out what has been done and who has been contacted for my case study for the Court of Human Rights and other litigations. I believe that Jamie has my CPD retention form and my 3 letters of complaint which have not been dealt with in your absence. 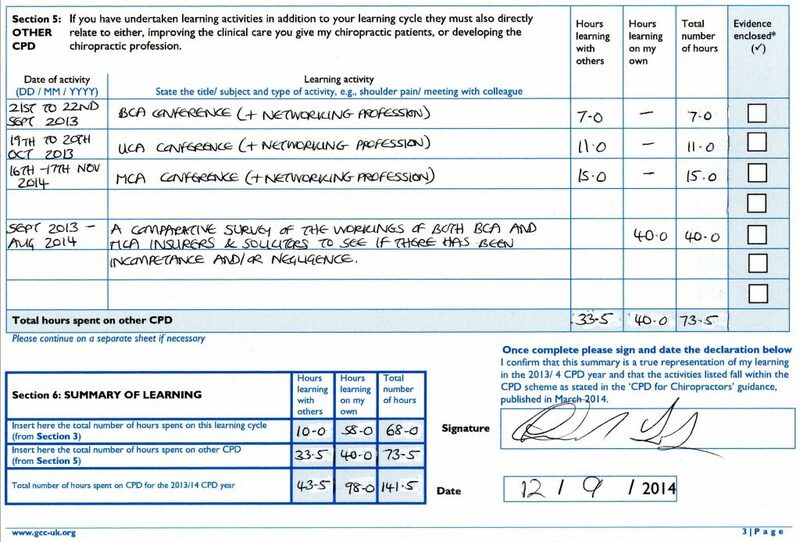 Clearly they show that my CPD is correct, and the information we discussed in correspondence regarding my networking at the ECU, BCA and UCA conferences gave me the information needed to formulate them. Where it says in the Chiropractic Act that you have discretion on how to deal with the law, you and your predecessor have taken it that it means discretion on whether you complied or not to the legislation, which seems to be where the problems have emanated. Law is law, you cannot pick and choose. Reading back through my correspondence to you, your non-compliance to the Chiropractic Act has had far-reaching effects, particularly over your duty of care for chiropractic patients, or lack of should I say. This is one of the major reasons for the GCC’s existence. If you had complied with the law I am sure that we would not be in this situation today. Even at this late stage you can comply but this is up to you to decide, or you may feel that a regulator is too big to fail, and continue with your current course where there will be consequences for your actions whether I am still in the profession or not. After all, my father treated my spectrum autism so I am certainly a chiropractic patient of long-standing and as such will still have a voice. My complaints are from me as a chiropractor and for my chiropractic patients (Child X and family) who I have been in contact with the GCC about, repeatedly, over the last 4 years. I believe that my Associations have been in contact on the subject but have been limited by my patient’s confidentiality agreement. Whilst on the subject of CPD please send me details of your CPD and Mr Howell’s, and also your CV which I am still waiting for. This should be covered by Freedom of Information and Transparency legislation. I have attached copies of my trilogy of complaint letters (dated 23/05/16, 27/15/16, and a third letter dated 06/06/16 which accompanied the e-mail of the same date.) So far all I have received is a line to say that Mr Howell will deal with the letter of 23rd May on his return. This is certainly not the way to handle a complaint as seen in our protocols and procedures. This letter is an official complaint and should be treated as one. In over 4 years you have not taken any action to stop the abuse, by the system, and others, of my patient. You were clearly informed by a series of letters and e-mails as the situation went steadily from bad to worse. I have informed you of significant problems on the insurance and legal worlds. 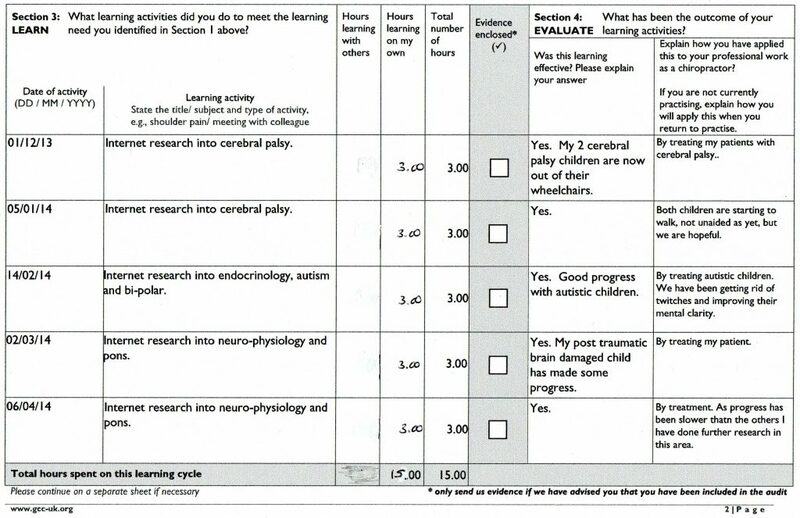 I have clearly shown why and how I diagnosed this child and with scientific back-up. I told you how the abuse was done, and by whom. 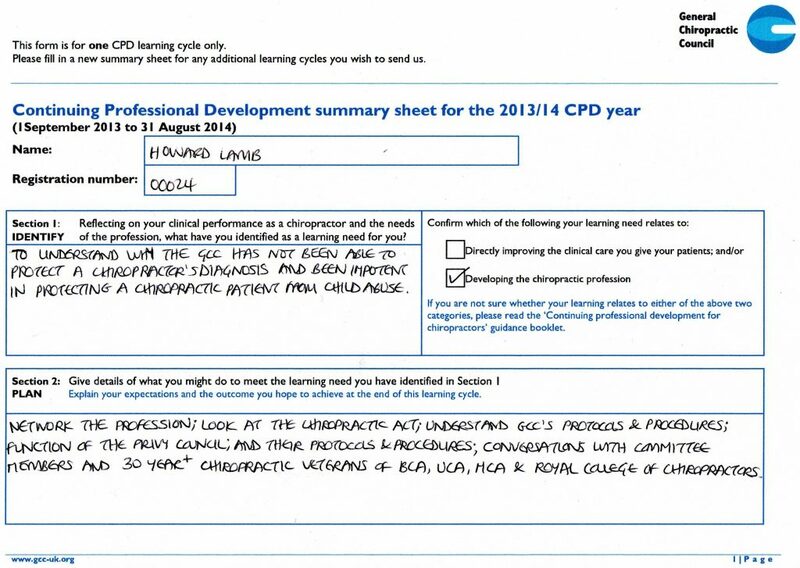 I highlighted these problems in my CPD (refused) and covering letter 2013/2014. Your back-up on simple things like right to diagnose and advance the profession would have made significant improvements to my patients’ lives. I would have had a voice and could then not have been ignored. All so that you can downgrade the profession further. My complaint is about Jamie Button who obviously did not show you your mandatory obligations. It has to be his responsibility as he sends them around the profession. Either he is incompetent, or you and he decided not to act on them, or you were told and ignored them. 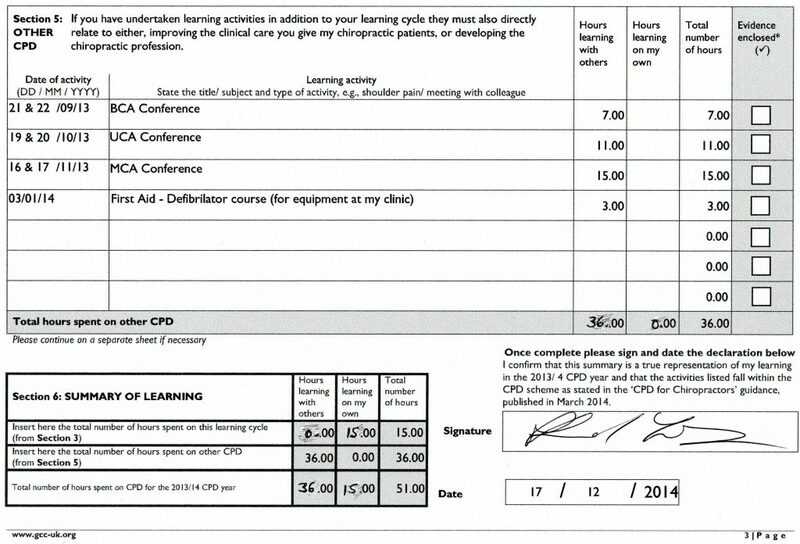 Please accept my CPD as you have received it, add my 2 letters of complaint to David, and my third which you have received, and hard copy to follow, proof for the record. 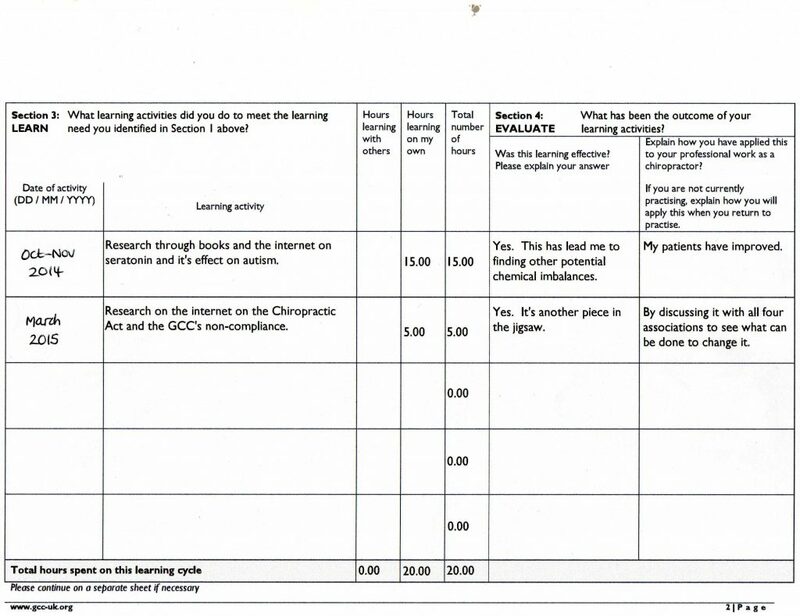 Once the complaint procedures are complete I am sure my CPD will be seen as helping my patients and advancing the profession, and will be accepted. My case should be adjourned until such time as the serious complaints against the GCC and its staff have been fully investigated by the correct authorities. If you have a problem with this, please let me know before your arbitrary deadline. Thank you for your prompt response. You have not stated, for the record, that you are protecting our Doctorates and advancing the profession. Obviously you can’t because history clearly shows that you are not, and have not done so. 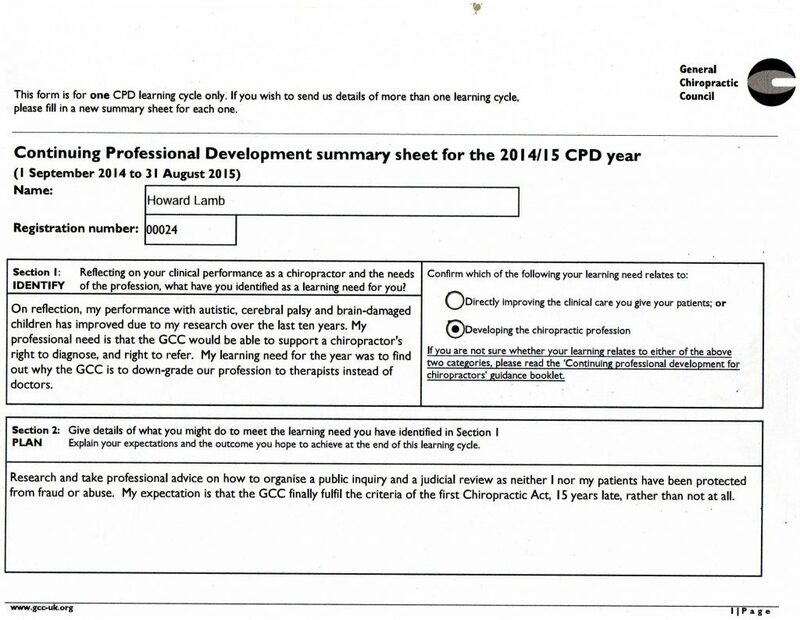 As you have not taken up the role of advancing our profession, I find it difficult to understand why you have refused my CPD. Obviously again, if you are and have not done your job as shown in the Chiropractic Act, we must do it ourselves and as such must be CPD eligible. Having someone in charge who has not done their job and has the power to throw me out of the profession cannot be right. I am still waiting on your chiropractic expert who would know whether my CPD is about advancing the profession or not. This is censorship, and as such I must make another formal complaint about you and your handling of this situation. Please send details of your complaints procedure to Paul Gardener. I will take his advice as to whether to change my CPD and advance my work for the Court of Human Rights by involving the Privy Council who are ultimately responsible for your actions. Your belated understanding of disabilities legislation is appreciated.